If your line of choice is where the water falls, then reach for the G20s. These “cramp-o-matics” are the epitome of light and fast when on blue ice. The single front-point G20s are tough and rigid underfoot for kicking into solid ice, yet weigh in at 420 grams. 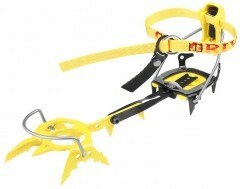 The crampons feature wire front bails for quick attachment onto ski boots, and nylon speed levers in the rear. It’s all backed up with a secure ankle strap. These ice climbers can be adjusted for different boots without a tool and come with anti-balling plates to prevent snow buildup underfoot. The Grivel G20s are the quickest way up the ice. Forged front point can hold up against hard ice and even rock. Stamped chromoly steel frame is rigid for solid placements. Asymmetric design offers agility when climbing tight spots. 11 total points support most boot sizes and styles. Designed to handle the toughest water ice routes. TUV certified to CE standards for ice climbing. Just wondering: It may be that the published weight of 794 gr is for the pair? And let me thank (and congratulate) you for the detailed information you have about all the products: weights, boots numbers, sole lenght and so on, not so easy to find information! Hey Agustin! Wow, thanks for pointing out our error, you are absolutely correct, I will edit right away!